A magnitude 6.9 earthquake occurred on Sunday, July 26, 2015 at 8:49 pm AKDT (July 27, 4:49 UTC) in the Fox Islands region of Alaska (red star on the map). It was located 87 km (54 miles) SSW of Nikolski and 267 km (167 miles) SW of Dutch Harbor. The mainshock was preceded by a foreshock sequence that began 4 hour earlier with a magnitude 4 earthquake. The mainshock was followed by a vigorous aftershock sequence with hundreds of events recorded (white circles). Twenty-five aftershocks were larger than magnitude 4, including five aftershocks with magnitudes 5 or above. The largest aftershock, magnitude 5.6, occurred 3 hours after the mainshock. This event was felt strongly in Nikoslki and also reported felt in Dutch Harbor. No reports of damage have been received. This is the largest event to occur in the region since the magnitude 6.9 earthquake on March 24, 1980 (pink star). The July 27 earthquake occurred on the convergent boundary between the subducting Pacific and overriding North American crustal plates. This region, where the Pacific Plate is being forced under the North American plate, is one of the world's most active seismic zones. 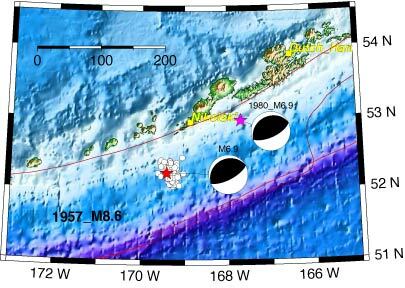 In 1957, a magnitude 8.6 Andreanof Islands earthquake ruptured a ~600 km-long portion of the plate boundary in the central Aleutian Islands. The 1980 and 2015 earthquakes are located near eastern end of the 1957 rupture zone. Waveform modeling indicates thrust type of faulting, consistent with the slip on the plate interface.